I absolutely thought that this was the fourth PARANORMAL ACTIVITY movie. Not only is it the fifth, but I have seen all of the other four. I suppose that is a testament to how cookie cutter the series has become. But I’m in this thing now. It’s the first modern horror series that I’ve cared enough to continue on, unless you count SCREAM (though that is tough, since most of them are over a decade old). So, any time a new PARANORMAL ACTIVITY finds its way into my view, I’ll give it a run. I watched PARANORMAL ACTIVITY: THE MARKED ONES (2014) on 1.4.15. It was my first viewing of the film. The fifth installment in this series seemed to go in a new direction. We leave white American suburbia for a small Latino community in California. The stars of this film are two recent high school graduates: Jesse (Andrew Jacobs) and Hector (Jorge Diaz). They are best buds, and a graduation gift of a camera has the two of them bouncing around town being boys. They ride down stairs in a laundry basket, do some drugs, and run a Go-Pro down a ventilation shaft to see some witchy things going on in the apartment below. Jesse ends up getting marked. This seems pretty cool, at first. 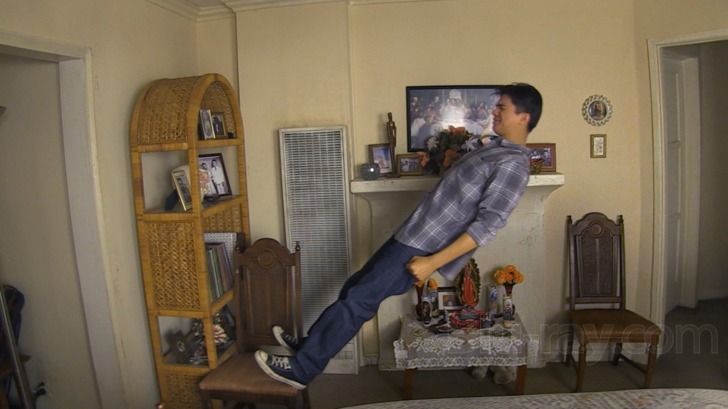 He gains super-human strength and the ability to levitate. He communicates with some sort of entity through a busted game of Simon. Things, as might be expected in this series, quickly begin to go south. Everything goes all demonic and angry. This fifth installment is not well reviewed. It should, however, get credit for trying to do several things the series has not yet tried. Jesse and Hector are the best lead pairing since the original film gave us Katie and Micah. They are funny, fallible, and likable. When Jesse starts having issues, we want to see him healed. THE MARKED ONES also changes the format up a bit. While this is still all found footage, the movie goes mobile. We have scenes set out on the streets as opposed to staying inside or in the back yard all the time. The movie is not a case of just setting up cameras and hoping to see ghosts. The movie avoids that urge, even when Jesse learns he has been sleepwalking at night. It chooses never to go there, instead mostly relying on Hector (and at times Jesse) to be our first person viewpoint through a bunch of craziness. There are a couple of arm-grasping moments. Jesse returns from what can only be described as another dimension, at one point, and the effect there is strong. An entire scene in the location of a murder builds some suspense, while paying off with nothing but real world fake scares and jump scares. The tendency is to put something showy there, but Writer/Director Christopher Landon shows respectable restraint. This isn’t the best PARANORMAL ACTIVITY. The first is certainly better. This one is on par with the third, both of which stand as superior to installments two and four. The flaws in this fifth one have to do mostly with logic. The boys (along with their female companion played by Gabrielle Walsh) often find themselves doing things that none would do: like submerging into a basement because they think they hear their dog. And a final showdown at a familiar PARANORMAL ACTIVITY location is marred somewhat by a couple of guys who bring guns to hunt witches, yet somehow have no problem with some kids filming them doing this illegal activity. But those are the sort of things you put aside when watching one of these films. The movie, as you might expect, does find its way back to the larger story. The very last scene is certainly eye opening, even if it makes little sense. It does open up the series to entirely new possibilities. Hopefully all of these story lines ultimately come to a head. Otherwise, this is going to feel like going down a rabbit hole which ends in nothing but a dirt wall. Cara entered this (and won) Shitfest a year or so ago. I watched it as a follow up and I didn’t think it was too bad. Then, when I posted my review saying just that, I got yelled at. It was okay. Although, if anything, it proved that maybe the Paranormal Activity formula has worn thin and needs to either be freshened back up, or left to go to waste. Good review John.